When the cats away... plumbing! When the Cats Away... the mice will do plumbing projects! However this also means I can get to a couple of the more disruptive boat jobs. And one of the most disruptive jobs is servicing the heads (that’s toilets and plumbing in land-speak). Not only does plumbing mean I have to open up floorboards and various lockers, find the spare parts and generally make a mess, it also means a certain amount of cursing and blue language as I run into unforeseen problems. What plumbing job doesn’t involve unforeseen problems? Well we do try our best to foresee difficulties and plan the needed parts. Why have a spare macerator if I also have a spares kit? Well my plan was to be able to quickly disconnect the pipes to the macerator, then just swap in the brand new pump. I have rebuilt these pumps before and I know it will take an hour or so. The plan was to be able to do that rebuild later at my leisure, and put the rebuilt pump back in my spares locker. It was just as well. The swap went quickly, I added the wiring quick-connectors on the new pump, took out the old pump, fitted the hoses in place and the swap was done in just a few minutes with minimum cursing. Oops, opening up the old pump I see it has 2 broken bolts in it (out of 4). There are two shorter bolts and 2 longer bolts that hold the motor to the pump assembly. One of those 2 longer bolts is broken, and the spare kit just gives you the 2 shorter bolts. I should have know this since I have used this same pump on Two-Step for years, and those bolts are the main weakness of this pump. Anyway, no excuses, today I pop around to Island Water World to see if they have the bolt studs. 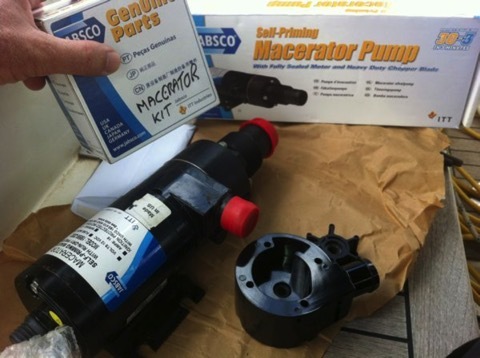 Then I can finish the pump rebuild and put it back in my spares kit. Thank goodness I had the whole spare pump otherwise it would have left an unpleasant mess until the parts could be sorted out. It always seemed to me if I actually did remember to bring my umbrella it wouldn’t rain... but if I forgot it then it would rain for sure! It sometimes seems to be the same with spare parts on a cruising sailboat. Try to bring along the spares you think you might need and it’s actually something else you find broken. I know... many people "poo-poo" electric heads (warning.... there may be more head-related humour within) but we have been having a very positive experience with our Tecma electric heads on Distant Shores II. I cannot speak for other electric heads, but I have admired the simple design, solid workmanship and easy operation. And so far they have been reliable... right up until a few days ago when I began to suspect something was up with the aft heads. I quick check of the bilge revealed the worst. A leak from the heads, and it wasn’t pretty. Rather than start disassembling immediately I dove into the parts locker to find all the parts I had bought for these heads. Since I had not owned a Tecma until we bought this boat, a Southerly 49, (3 years ago) I hadn’t known what might need fixing. So I basically bought one of everything as a spare part. Anyway, here I am admiring the large pile of expensive spare parts, confident that one of these hoses was likely to be the odiferous cause of my woes, and proud that I had the parts. Now to get to the actual repair. At this point I seem to have lost my enthusiasm for photography and did not record any more pictures. 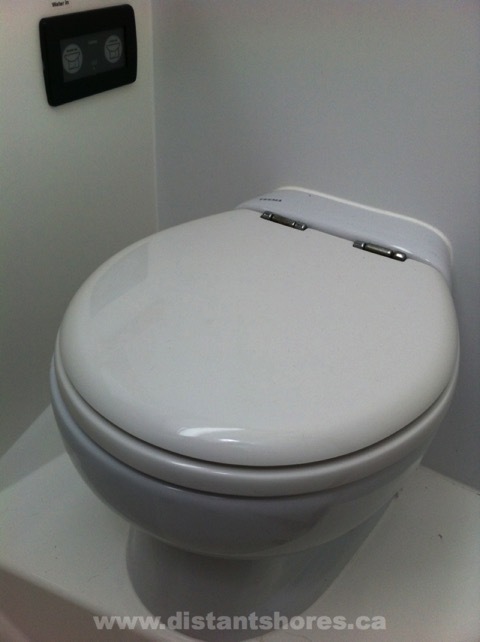 1) Detach toilet - this entailed cutting the silicone sealing the whole unit in place, and removing the 4 screws holding it down. 3) Disconnect hoses - I removed the saltwater intake hose, but the outflow hose had already come off!! Problem Found. the hose clamp was not tightened down enough and the outflow fitting has slipped right out. Result - direct discharge into the bilge whenever the toilet was operated! Yikes!! Solution - re-assemble and tighten to insure the fitting doesn’t come off again! During the disassembly procedure I carefully inspected all the hoses and the macerator. All appeared to be in top shape. No sign of age or any problems, so I did not actually need any of the spare parts. Looking for the "silver-lining" in a generally "s__t" day, I can say it felt good to start the project knowing I had all the parts that could possibly be needed. I would not be faced with a long delay trying to get spare parts to get the head back in action. Just like carrying an umbrella and not worrying that it might rain. A sailor on watch pops down to get a cup of tea and finds the floorboards awash. All of these stories are true but in most cases I believe they could have been prevented. One of the most common causes of sinking is simply some sort of leak that went undetected until it was too late. A hose clamp fails, a hose bursts, a pump back-syphons, an anti-syphon valve sticks, a thruhull fitting cracks... you get the idea. 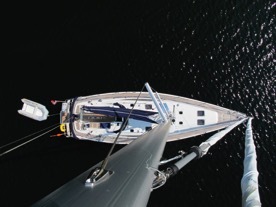 Modern boats are somewhat complicated and many things COULD go wrong. The main point is that many of these potential leaks is small and easy to deal with IF you know you have a problem. Unfortunately most boats do not let you know you have that problem! A beautiful little Rule Automatic bilge pump will deal with a certain amount of water coming in to the bilge. It will continue to try to keep up with the leak but it is so quiet that you will likely not hear it and never know you have a problem. A bilge alarm can solve this! And for a VERY affordable price it is the cheapest insurance you can buy!! 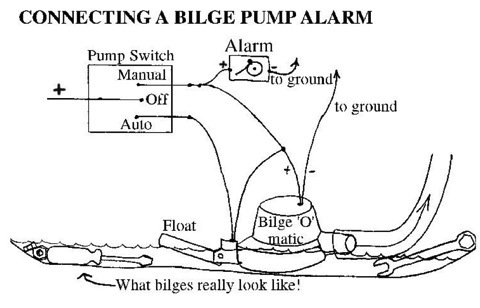 Broadly speaking there are two types of bilge alarm. Water detectors and bilge-pump alarms. One will detect water that is getting to a dangerous level. The second detects when you bilge pump has activated itself. Alternatively it can be set up to detect ANY water in the bilge by putting it below the level the bilge pump will activate. Then you will hear the alarm whenever water enters the bilge. It depends on the type of boat you have whether you might prefer this. Our first boat "Two-Step" had a very deep bilge and all water would drain to this small space where the bilge pumps were located. Pour 1 litre of water into the bilge anywhere and it would drain down to this bucket-sized bilge where it would set off this alarm. Another option is to connect a loud alarm to let you know the bilge pump has been activated. This is my preferred solution and I have installed these alarms on all our boats. It is really quite simple and inexpensive - the ones I installed on Distant Shores II cost less than $4 each. What a DEAL for such super insurance!! 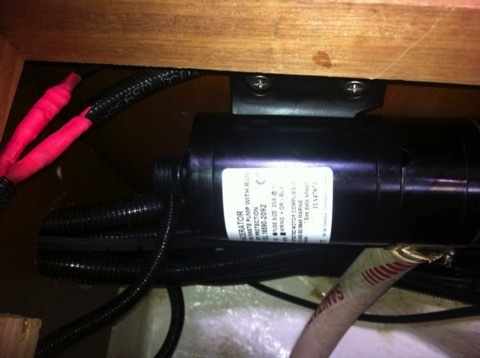 Basically all you have to do is connect a beeper or buzzer to the manual side of the typical bilge pump control. This means any time the pump has power then the alarm will sound. Optional - I also added a switch to turn the alarm off again. In the event the bilge pump DOES come on and you are busy trying to find the leak, you might want to turn off the alarm. I installed the switch inline with the alarm. Easy and made the price more than $5 total! !